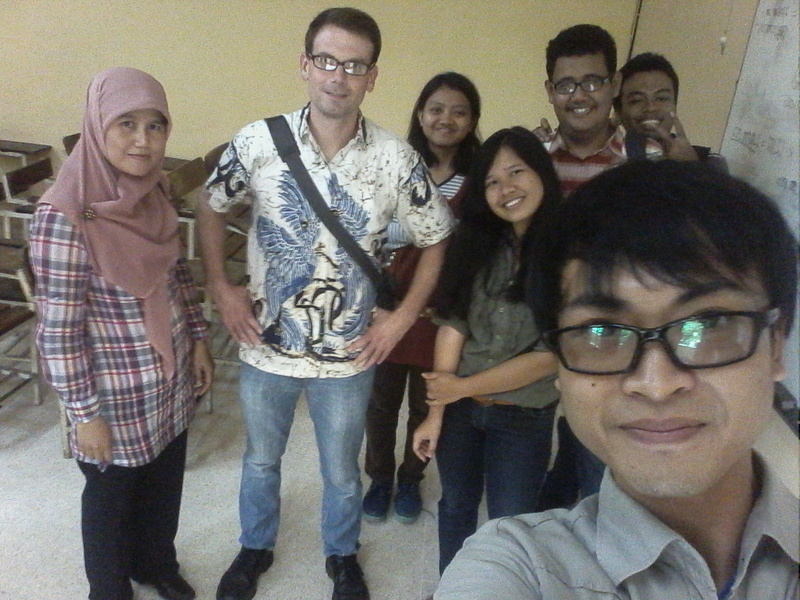 Last week I gave an invited presentation at Universitas Diponegoro. As I was thinking about what to say from our distressed place in the hotel in Jakarta, I wasn't feeling very enthusiastic. But by the time I got there (after we were settled back into Solo), I was so glad they invited me. The presentation was on Monday last week. And then also included here are a few pictures from a presentation I gave on Thursday last week at my home university in Solo. We left Solo at 5am to get to Semarang by 8am for a 9am presentation. We stopped at a gas station along the way that seemed like it placed a high priority on animal husbandry. I was so glad we stopped too. The only gas station I've been to that was more dedicated animals on display is a gas station in Utah that we've sometimes needed to stop at, going south, that keeps a petting zoo. Everyone says it take three hours to get from Solo to Semarang. But it only took two hours for my taxi driver and me. It wound up being a pretty big crowd. On the front row, left to right: the session moderator, the dean, and the other presenter at the event. Afterwards we went to a restaurant and I got bakmie goreng (fried noodles) and es campur durian (mixed ice with durian). I got home by about three and showed everyone what I got in Solo. S was so impressed with how pretty they had made the inside of the box that my plaque came in. Such nice, red, crushed velvet. Then here are a few pics from the presentation on Thursday, back in Solo. The food vendors that run their carts through our neighborhood (or any neighborhood here) each have a different sound that they make to let people in the house know: If you want your sate/bakso/soto/roti/eskrim, you need to come out of your house now and get it before I pass you by. We don't go out to see the carts that often because they go by all the time, but we do enjoy listening to the different sounds they make: the tock-tock-tock of the bakso sellers wooden bell, the ting-ting-ting of a soto seller's ceramic bowel, the double-timed Christmas carols of the roti seller, the song that has temporarily slipped our minds of the eskrim seller. It would seem like we've got the sounds pretty well matched with the wares. But there's one sound that's been a mystery to us, since it happens generally between 10:30 and 11:00 at night, and we're usually winding down at that point, not in the position to go out and see who's selling some type of food we don't even want. The sound: N says it's sounded to her like a little horse decked out with bells pulling a little food cart. To me, it sounds like crickets when it first comes into ear range. Then closer, it sounds like a rain stick. Then it fades to crickets again. The other evening curiosity to see a horse got the better of N and she went out and peeked through the cracks in our fence. And there she saw it, a ship on wheels. She said it passed quickly and she had a sense that she was seeing something mystical, forbidden. Tonight, it passed by again and we both rushed out to see the forbidden boat, the ghost ship of the near-midnight hour. It turned out it was selling sate, and it had sailed from the island of Madura. Here's the martabak stall. This is actually indoors rather than itinerant and on the street like the one we usually buy from. But it still has a lot of streetgeist. N's got such a good eye. She saw that the neighborhood adjacent to the martabak stall is named Komodo Tiga. Named after either the Komodo Dragon or the island Komodo from which it hails. This martabak stand makes terang bulan (a folded pancake with cheese, chocolate, and peanuts) in the regular way and then in the "Special Executive Variation" (as noted in the upper right of this sign) that uses European products. Neither of us is an executive, so we settled for the normal martabak, which cost half the price of the special executive variation. Ahoy there! We thought you were a horse. He was 50 meters down the road before we got out, but we caught up to him. By the time we ran after him and took a picture of his ship, we were obligated to buy some of what he was selling. So that's our sate cooking on the little charcoal grill that the ship is appointed with. 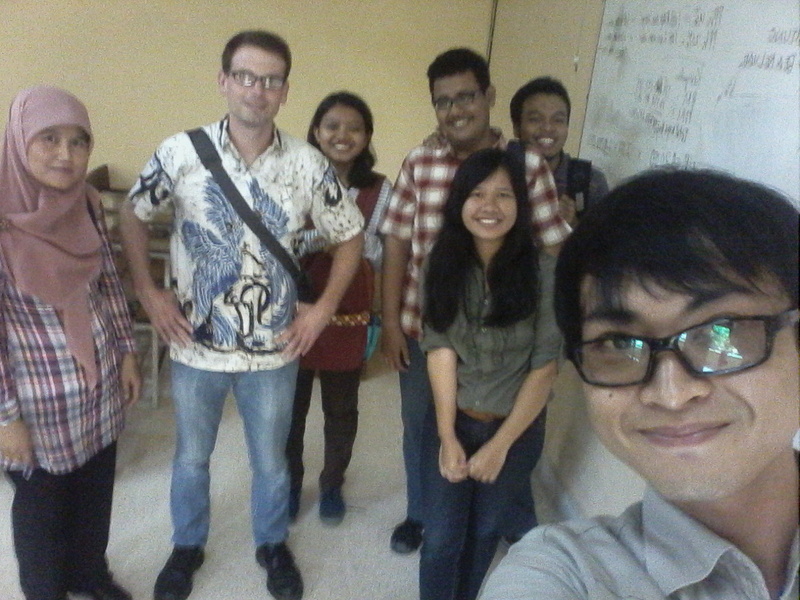 With travel to Australia and then two work weeks in Jakarta, I became disoriented in terms of the semester schedule. So disoriented that when I showed up to teach my two classes this week, I was surprised to learn from my co-teachers that it was the final day of class! (Some of the surprise isn't entirely my fault, since the semester schedule was never very firm, and it was always hard to nail down when exactly the last day of class would be.) So as an end to things in the upper-level course, we took some pictures. This pic is actually from about midway through the semester. 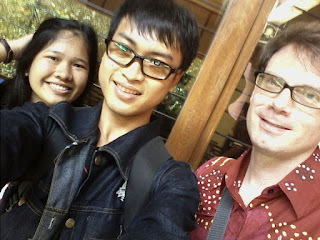 One day I showed up to class and saw two of my students hanging out several paces from the classroom door. They were laughing and seemed like they were trying to hide in plain sight if that makes sense. I walked over and one of them looked over at me and said, like he had been caught doing something wicked that he was at the same time proud of: "Mister Brian, we are taking selfies!" Then both of them laughed in what seemed like joyful embarrassment. I said, "Well you should take a selfie with me in it," and so he took one. Then a week or so later we talked in class about the way that the international interest in selfies might grow out of a structure of feeling produced by neoliberalism. The students again laughed like they were doing something wicked that they nonetheless felt proud of. This week at the end we at first didn't have anyone to take our picture, so T took some pics because everyone knew he was the best at taking selfies. But then we pulled someone in to take our picture. On Friday, I walked over to our neighbor Pak Marno's house to see if he would take me on his becak over to the track so I could run. 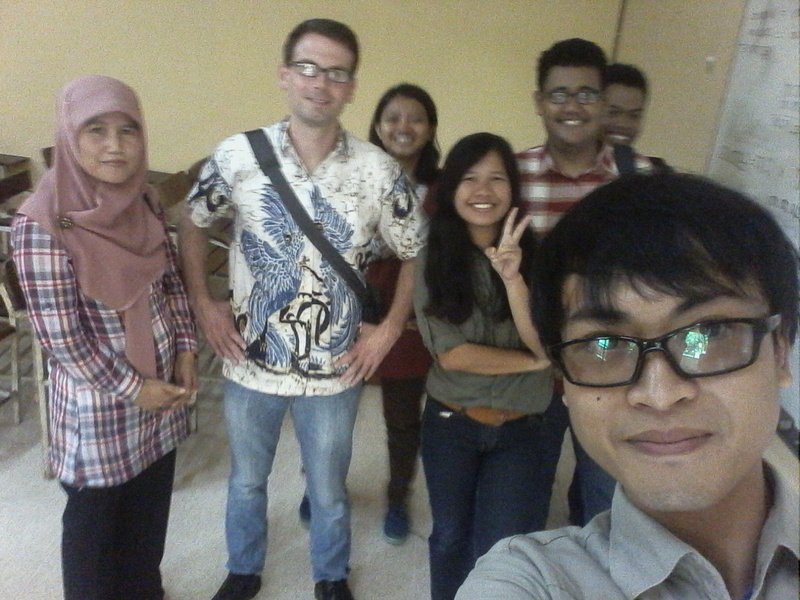 (It had been nearly a month since I had run, with traveling to Australia and Jakarta.) On the drive back from the track, the becak stopped for no apparent reason. I looked back to see if everything was okay with Pak Marno but he was gone! So I just sat there for maybe fifteen seconds, wondering. But soon Pak Marno came running back to his seat behind the cab of the becak. He said something that I didn't understand and then we started moving again. When we got back to the house, I handed him his fare and as I passed the bills to him I saw he had a rock in his hand. I asked him if he had stopped to pick the rock up off the ground. He said yes. I asked him why he wanted it. And he said he just saw it and wanted it. From the glance I got of the rock, it was smooth but not shiny. It wouldn't have been anything special in the desert of southern Utah, but it did seem fairly special among the cement shards of Solo's side streets. Maybe Pak Marno saw the rock and thought it could be ground into a stone for a ring? Or maybe more simply it appealed to his aesthetic sense. (I just saw it and wanted it seems like a classic aesthetic reaction to me.) In any case, on Sunday we went for a walk through some neighboring kampungs, and I took pictures in a general trend toward hitting on some of the aesthetic sensibilities I see here. Not all the pictures here are about beauty and adornment, even if that's something I was thinking about as we walked. How did roosters get so good looking? A boy in the street flying a kite. Leftover rice drying on a flat basket on an orange tarp set on a bicycle. N pointed out a sign about juice for sale for 25 cents. S pretending to be the statue of liberty, standing on a stout post placed in the intersection to keep people from speeding through the little roads. A grid of potted plants (or at least the pots) moving up the side of a wall. We talked to the people who had this bird in the cage. They said it was ayam hutan, jungle fowl. A circular swing in front of a rainbow fence. In front of a house that's seemed fairly hardscrabble: busts and a plaque. W asked why anyone would put glass along the top of their fence. I thought of a poem I had once heard, a dramatic monologue spoken by a Latin American dictator. In that poem, he said the glass on the top of his wall was placed there to scoop out a kneecap. We left one kampung and came out onto a main road, with a barbershop, before we walked into the next. How does a presidential candidate get people to belief something like this? "Jokowi is us. "/"We are Jokowi." But I guess that's what every successful candidate has to convince people of on some level. The stonework tells a story that happened before the story the doors tell. N stopped to smell the flowers and said they had no smell. S wanted to check. Bad water in an alley. But the bad water looks nice. W saw some pigeons on the top of a building. We walked by a little house, and a little rooster, really pint-sized, walked out of the house with the over-sized confidence of a chihuahua. But it seemed friendly, unlike almost every chicken and every chihuahua I've ever met. After it approached us, the man who lived in the house came out and pet the rooster like it was a cat or a little dog. As we walked we got closer and closer to an unpleasant sound. It turned out to be coming from a chest of drawers, modified to fit onto a bicycle, and further modified to steam food, cooking it in bamboo tubes. You'll see the metal release valve for the steam on the top left. The steam streaming out of the valve was making the noise. After looking at these "flowers" (they were so impressive it hardly seems fitting to classify them with tulips, which are nice but not nearly as impressive, in my opinion), I wondered why this plant isn't planted everywhere. The man with the bamboo tube steaming bicycle passed us as we walked, riding off into the sunset. N also pointed out that somehow, the brand No Fear (big in the 90s) has survived, in the crannies of Solo's kampungs, of all the places in the world. There's something in me that makes me wish my neighborhood in the US was a place where people could be bold enough to paint their houses like this. N pointed out how the bonsai trees, whose roots grow fat, start looking like animals. We met a man who had a hair salon. He and his wife kept plants all over the place, on their own side of the street and on the opposite side. W said this broke brick lattice looked like a fish. He suggested we ought to pack it home for our friend Moses. But we're hoping Moses will be satisfied just to see a picture. Maybe he could break some bricks in Utah into the shape of fish. We met a father and daughter. N struck up a conversation and said she liked the daughter's Iron Man outfit. (I had never known N to like superheroes but I guess she does like them.) Looking at the pic and thinking about Iron Man, I wonder if this wasn't a daughter but a son. The child shook N's hand and then, as children are taught to do here, he took her hand and put it against his cheek. Then the father invited us to enter a patio where his friends were (of all things) grinding stones to make rings! Here's a bracelet I took a pic of. The man who made it said it's rare to see bracelets but common to see rings. Based on my own experience, I think he's right. We were getting close to our own kampung now. Walking along the busy road in front of it. I've been along the road many times but had never noticed this busted up building. We stopped quickly and looked at a little batik store in our kampung. We had never seen it open before. Pak Marno and his wife have a sign in at the entrance to their little house. It says "Ngamen gratis," or, "If you're coming around here singing and looking for money for your songs, we won't pay you and you'll sing for free." There's enough of aesthetic life on the streets of the kampungs that people can afford to send ngamen, or traveling musicians, traveling to other doorsteps.